On Wednesday, October 6th from 9:00 am – 10:00 am, I’ll be speaking on Social Media Strategy for Newbies: How To Get Started. A firm believer in the importance of incorporating digital marketing strategies into a real estate business plan, I’m excited to be presenting on this topic with the goal of getting Realtors pointed down the right path with social media. I understand how the myriad of digital tools – such as blogging, Facebook, Twitter, YouTube, LinkedIn, FourSquare, texting, email, CRM systems, websites - can seem like too many options and technically overwhelming to many agents. In addition, the pace of technology evolution can leave some feeling left in the dust. My goal is to simplify the seemingly complex, discuss the foundational elements you need to succeed in social media, focus the audience on a strategy that will be an effective and practical, and highlight where today’s Realtor should focus their time and resources. C.A.R. 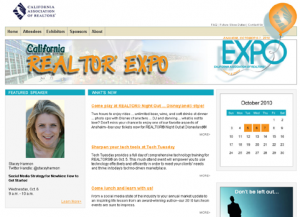 EXPO is a member benefit and as a result, there is no fee to attend if you are a member of the California Association of Realtors. You just need to register here and you are in. Whether you consider yourself a tech novice or a member of real estate's digital elite, Tech Tuesday offers an array of sessions focusing on the hot topics you need to know more about, now. The Tech Tuesday lineup if filled with some great sessions and outstanding speakers. There is a heavy focus on social media and I believe Tech Tuesday is a good investment for any Realtor looking for quality presenters talking about business relevant technologies of today. I’ll be attending many of the sessions and look forward to watching presentations by many of my friends and colleagues in the space. There is always something new to learn. Tech Tuesday costs $95 to attend and you can register at the CAR Expo website. On Monday, October 4th, I, along with many of the Tech Tuesday speakers, will be attending RE BarCamp CAR Expo (also at the Anaheim convention center). REBarCamp CAR Expo is a free, one day gathering of technology curious REALTORS® and industry professionals who come together to discuss how social media and technology are evolving the business of real estate. I’ve been actively involved in prior RE BarCamps which happen all over the nation, having coordinated RE BarCamp Orange County two years running and RE BarCamp NAR in San Diego last year. RE BarCamp is a full day of networking and learning and if you are in the Anaheim area on Monday and want to soak up some great information on technology and real estate, you should plan to attend. There is no cost to participate in this event, but you do need to pre-register at the RE BarCamp CAR Expo website. One of my favorite parts about attending events like the CAR Expo is the people that I meet. If you will be attending my session, or any of the surrounding events, please introduce yourself. And, if you are on twitter, send me a tweet (@staceyharmon) so we connect. See you in Anaheim! Real Estate Business Development, Marketing, and Technology Training – Join In!